Designed to handle even extreme applications, the i600 Series Scanners are loaded with the features you've asked for. These three sensational desktop scanners-the i620, i640 and i660-offer you exceptional price/performance. Not to mention incredible image quality, super-fast image processing and reliable paper handling. Their autofeeder is sensitive enough to handle rice paper without damaging it. And their onboard optics are powerful enough to scan the most challenging documents. They're easy to use and designed to meet the latest ergonomic standards. Simply put, there's nothing but performance and precision under the hood of the i600 Series. We've built a lot into them, so you can get a lot out of them. Part swiss watch. Part sport utility vehicle. You want imaging that's as precise as it is powerful? You got it. The i600 Series boasts new and improved image processing features to help maximize your image quality on every scan-without slowing down. Like Perfect Page Scanning with iThresholding, which delivers clean, crisp images at full speed and reduces pre-sorting and re-scans. Skew Angle Determination and Wider Image area enhancements provide an even more accurate deskew, even for A3 size documents. Aggressive Cropping ensures no black borders on your images. And Electronic colour Dropout allows you to remove irrelevant background colour without stopping to change lamps. All of which makes you ready for serious scanning. Like playing with paper. May we suggest an origami class? The i600 Series features improved SurePath paper handling for a smoother workflow. Its multi-feed detection system uses three ultrasonic sensors for highly reliable detection of adhesive labels and stuck-together documents, saving you time and headaches. Plus, it scans all sorts of paper thicknesses-from 7-pound to 110-pound stock. 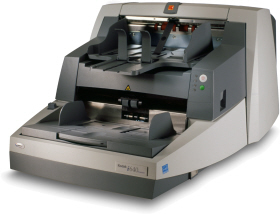 On top of that, the i600 Series features multiple feeding positions to accommodate a wide range of document shapes and sizes, including checks. The output tray is adjustable, so documents are stacked the same way they were fed. What's more, the Ultra-Lightweight Feed Module accessory allows you to snap in a different feeder and handle even very thin documents. Talk about fast-the i600 Series quickly delivers high-quality images via five output modes: colour, bitonal, grayscale, simultaneous bitonal and grayscale, or simultaneous bitonal and colour. So you can output up to 480 images per minute. And you can scan mixed batches with virtually no pre-sorting and get through your toughest workloads faster than ever. Now, that's some serious horsepower.